Trying to move a patient without understanding leverage is like changing a flat tire without a jack. Movers routinely move very heavy items without anyone going to the hospital because they understand the principle of leverage. The human body is not only heavy but it is not rigid making it difficult to move without knowledge of basic transfer mechanics. There are small inexpensive tools available that can make it easier. There are two important factors in a human transfer. The first is form. The form is what makes the body rigid during the transfer and the second is leverage. 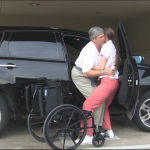 Leverage can reduce the leverage transfer weight (weight the caregiver must offset) to as little as 10% of the weight of the person being transferred. Sounds hard to believe? It was all but impossible to even conceive for a 125 lb wife to move her 250 lb husband all alone. With less than 15 minutes of training and two simple tools she was able to do it over and over. She still could not believe this happened. Before you attempt a world class lift learn about the tools and techniques that can save your back and reduce the risk of injury to your patient.